The Professional Development Committee has had a busy fall. After the July 2014 ALAO Board approval of a 2-year pilot ALAO Mentoring Program, our committee has been busy marketing, creating a web presence (www.alaoweb.org/Mentor), accepting registrations, creating a contract form, and writing up a set of guidelines for the program. Registration closes on December 12 and participants will be matched and notified by mid-January 2015. In addition, the Committee submitted a grant proposal in collaboration with OhioLINK in the hopes of bringing the ACRL Scholarly Communications Roadshow, “Scholarly Communication: From Understanding to Engagement,” to Ohio in 2015 at a discount. We should know soon whether or not we were successful. Please keep your eyes out for the 2015 Continuing Education Grants application deadlines, which will come early next year as well. 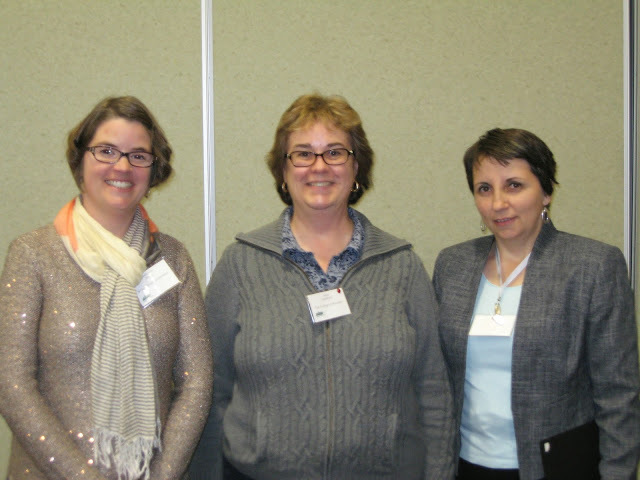 2014 CE Grant winners were recognized at the Annual Conference; two of the winners, Maureen Berry, Wright State University (on the left in the accompanying photo) and Daniela Solomon, Case Western Reserve University (on the right), are pictured here with Committee Chair Julia Gustafson (center). This entry was posted in Vol. 32 no. 3 (Dec. 2014) and tagged Professional Development Committee. Bookmark the permalink.